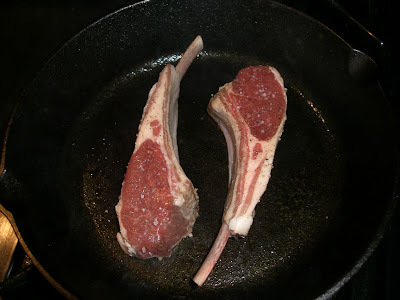 For lunch today, I tried making lamb chops for the first time. I don't know why I haven't thought of doing that before. It's another of those things that is so quick and easy to cook, that it's perfect for lunches at home. For sides, I sautéed broccolini and shitake mushrooms (separately). Here is how it went down. 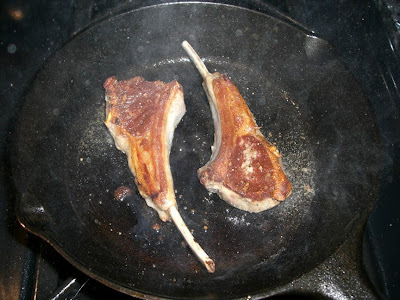 I figured the easiest way do do lamb chops would be a quick pan sear. I rubbed them lightly with olive oil, seasoned with sea salt and freshly ground pepper, them let rest for a moment while I heated the pan. I trimmed the broccolini and crushed and chopped a glove of garlic. I also prepped the baby shitake mushrooms (not shown) by removing the stems, which may not have been necessary, as young as they were, but I did so anyway. 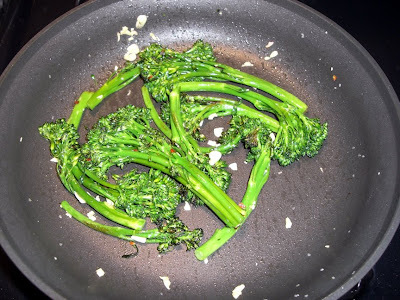 As the chops were cooking, I sautéed the broccolini with red pepper flakes in olive oil in a separate pan at medium high heat for a few minutes, adding the garlic almost at the very end. A sprinkling of kosher salt and fresh pepper finished it off. 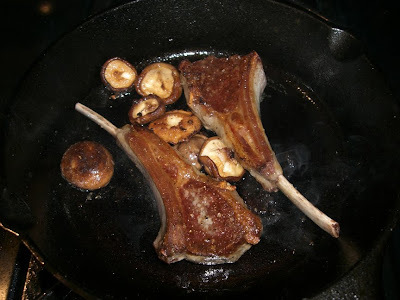 As soon as the lamb chops were done, I removed them from the skillet and let them rest for a moment while I added a dab of butter and the mushrooms to the same pan, letting them soak up some of the pan flavor that the lamb chops had left, then returned the chops to the pan for one final sweep though the mushroomy butter reduction that was forming. I overcooked the lamb chops. Not to the point of inedibility, but just enough that they were completely cooked through, with not a bit of pink in the inside. I know now what to do better next time. Less time on the first side, cook less than I think I should if I want medium rare, then let it rest to finish, and really... they let off enough of their own fat that other than that first rubbing with oil, I don't think any extra is necessary. Anyone have suggestions for how I could have done this better? I'd love to try it again soon. 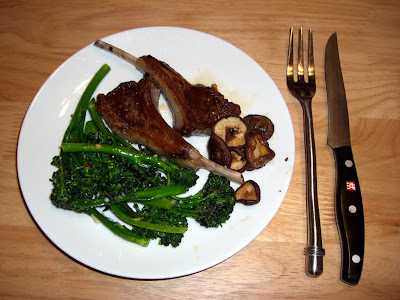 The broccolini and mushrooms were delicious and needed no tweaking. You know what's really good? 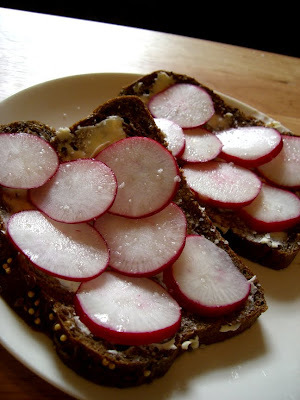 Dark German wheat bread slathered in Smith Creamery butter, covered in sliced radishes and topped with sea salt. Really, really good. My bread, today, is a silly grocery store brand but if you try this on an excellent dark bread, such as they bake at La Boulangerie on Magazine street at Cadiz, you will intensify the goodness by an extra million degrees. 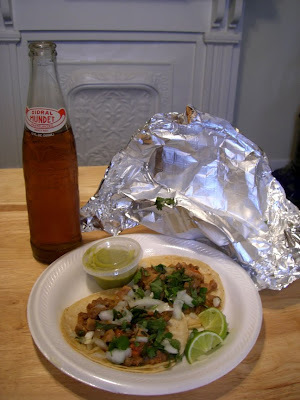 Two pork tacos with cilantro and onion, lime and green salsa: $3.00. One Sindral Mundet (a Mexican apple soda that I am in love with) $1.50. Mmmm, delicious. Tacqueria D.F. is a great little taco truck that parks in front of the Laundromat Zone at 8807 South Claiborne Avenue in New Orleans. You hit is just as you are leaving the city and heading towards Harahan. It's cheap and delicious. There are 4 or 5 meats to choose from. I think I have had the beef, grilled pork, carnitas, beef tongue, maybe one other, on different visits, and all were good and well worth the $1.50 per taco. I hear that the tortas are great. You should stop by. I haven't really cooked anything interesting in the last week, nor have we gone out, so I'm pretty lean on the blog material. 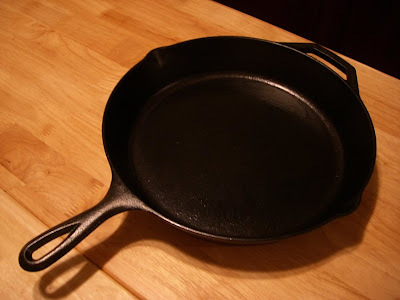 I did buy a 12 inch cast iron Lodge skillet last week. The only thing that I've cooked in it so far is hamburgers and pork chops, so I could use some inspiration. Anyone have any ideas for how I can really break it in right? Gumbo making is stressful business for me. 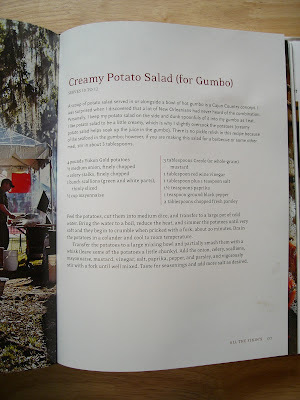 I didn't grow up with a Southern Louisiana mama to show me the ropes, so I've had to figure it out on my own, with only vague recipes and the occasional video on making roux to assist me. 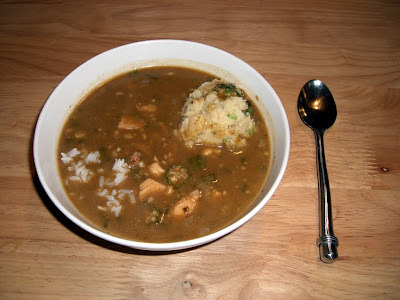 To be honest, I spent the first seven or eight years of living in New Orleans making gumbo from a box of Autin's Cajun Cookery gumbo mix. When I finally decided that I really wanted to learn to make it from scratch, I realized that I was a complete idiot at making roux. I didn't understand how long it was supposed to take to get dark brown. Didn't know just how much to stir to keep it from burning. Didn't understand how to get it from that medium caramel-y brown to the dark chocolatey brown it is supposed to be for gumbo without having a coronary in the process. Still don't. However, I persist. For the Saints game on Saturday, we had our lovely neighbors over for gametime and dinner. 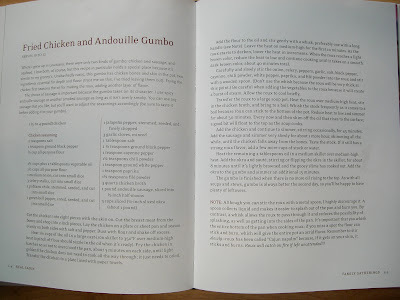 I decided to try the Fried Chicken and Andouille Gumbo recipe from Donald Link's Real Cajun. Also made a side of his potato salad since I love a scoop of potato salad in the bowl alongside my rice. The first thing I did wrong was grossly underestimate how long it would take to cook. I skimmed the recipe a few times and settled on 2.5 - 3 hours in my mind. It took much longer than that. Probably closer to 6. Making the roux took me an hour. Is that right?? The book says that the process should take about 40 minutes, but I stirred and stirred and fretted and frowned over it and still didn't have the dark brown I needed until 60 full minutes had passed. When I finally gave up and threw the onions in, it had just barely reached a dark brown and could easily have gone darker still, but I was so exhausted by the effort at that point that I decided good was good enough. I don't know what I do wrong. Maybe I stir too fast. Maybe I'm too timid with the heat. Whatever the case, making roux makes me feel like I'm going to have a panic attack, every time. I've got to master this. Any suggestions are welcomed. Oh, the gumbo? It was excellent. Best gumbo I've ever made. The poblano pepper and jalapeno made it lip tinglingly hot in just the right way. The potato salad was a perfect accompaniment. Donald Link mentions that he likes it in seafood gumbo, but it was delicious in the chicken andouille as well. When all is said and done, I think that if I spend the next few years of my life figuring out how to perfect my roux technique on this gumbo recipe, it will be time well spent. p.s. I didn't use chicken on the bone for my gumbo, even though the recipe calls for it. Kid Cayenne wouldn't have eaten it. While I'm sure that using only boneless, skinless breast caused it to sacrifice in flavor, we didn't feel one bit deprived. It was truly delicious. I discovered Fage Greek strained yogurt about a year ago, I guess. Where had it been all my life? I was investigating yogurts after a trip to San Francisco to see my dear friend whose husband makes me these gorgeous breakfasts when I visit. 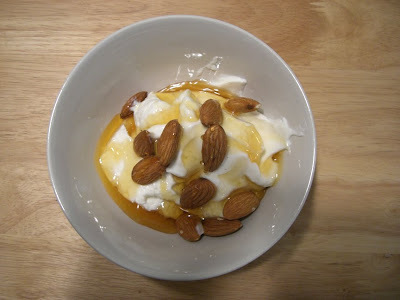 He had given me a bowl of the silkiest, lightest, most incredible French style yogurt with a fruit fool that was haunting my breakfast dreams and I was trying to find a similar style yogurt back here in New Orleans. I was unsuccessful. What I did find, however, is Fage (pronounced Fay-eh) Greek yogurt. It's the opposite, really, of what I was looking for. Rather than silky and light, it is dense and creamy. Strained to remove the whey, it is thick, like an extra heavy sour cream before anyone messes it up by stirring. And the taste! So, so delicious. There are no stupid flavors, no additives... just really good yogurt. Tangy without being bitter, sweet without being cloying, it is the perfect backdrop for small additions... my favorite being honey and almonds. I buy it in the large containers and have it for breakfast, adding different things according to my mood. A bit of cherry preserves is great, sliced banana and granola is lovely, berries are wonderful. It's hard to go wrong. You can get it in whole fat, 2% or fat free, and I've tried all three. They are all good and all taste decadent so get whatever your waistline dictates. I buy it at Whole Foods or Robert Fresh Market on Carrollton and Claiborne. You can also buy single serving containers that have a side well of topping. I have only bought the cherry version of it, but I'll tell you it's really delicious. Honestly though, a little drizzle of honey is all you need. Which brings me to another of my favorite things: honey from Jay Martin, beekeeper on Short St in New Orleans. Been eating it for years. It's my favorite honey. If anyone knows Jay Martin, please give him and his bees my compliments. 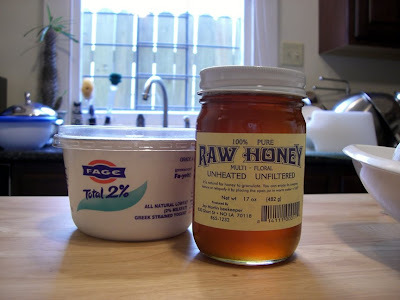 It's such a gentle, yet flavorful honey that I could eat it by the spoonful. Also available at Whole Foods and other local spots. Very good stuff. Years ago, before Katrina, I was the operations manager for a bed and breakfast, day spa and coffee house in the French Quarter. One of the skills I developed in that job was the ability to bake really exquisite muffins and scones. Sadly, I seem to have lost the knack. Inspired by Bouillie's post, last week, about what to do with her freeze instigated citrus harvest and subsequent Meyer lemon baking spree, I thought I'd make some Meyer lemon and candied ginger muffins. 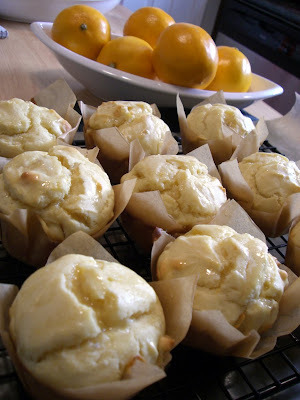 I used to make a lemon ginger muffin at VooBrew that was out of this world, but no longer have the recipe. Hunting around on the internet got me a few to try and I guess I just picked the wrong one because the muffins I baked this morning are a real dud. Too floury, not enough lemon, not enough ginger. Even drizzling them with a glaze made of Meyer lemon juice and sugar didn't liven them up enough to make them worth sharing the recipe or making again. *sigh* Oh well. 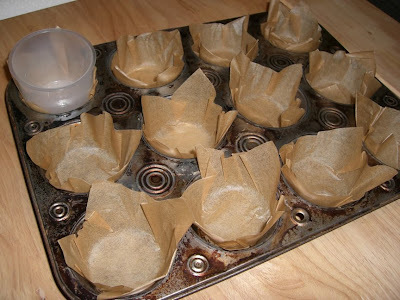 I did learn a nice trick for improvising paper muffin tin liners. 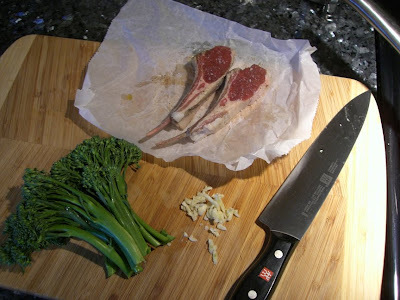 Cut parchment paper into 4 inch squares and press down into the muffin tin with a small cup (in my case, the rice measuring cup from my rice cooker was the perfect size). Instant rustic muffin papers! Still have plenty of Meyer lemons left to try other (hopefully more successful) recipes with. Stay tuned. I don't have much experience with Spanish food, although it deeply intrigues me. 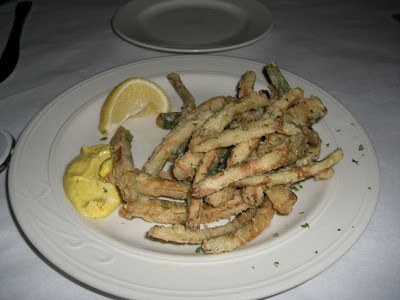 At the moment, I am particularly interested in tapas for the very simple reason that the small plate concept is the perfect way for me to appease my desire for a meal consisting of many tastes of many small things rather than a large entree with only one or two flavor variations. It also works beautifully for Kid Cayenne and I, who have very different ideas about what we want to eat. Ordering 5 or 6 small plates allows us to share food that we both enjoy while keeping a few things just to ourselves. For New Year's Eve, we wanted a quiet dinner close to home. We chose to go to Cafe Granada on Carrollton for tapas. We had been there once before and had mostly liked it. It wasn't perfect, but had potential and warranted a second visit before we formed a firm opinion. Zucchini Fritters ($5): julienned strips of zucchini battered and deep fried, served with a saffron aioli. We had ordered this the last time we came and loved it. It was just as good the second time. The batter was light and very crisp, the zucchini sweet and perfectly tender crisp inside. A sprinkle of fresh lemon juice over the top and then a quick sweep through the aioli made this dish so delicious that we almost fought over the last few pieces. 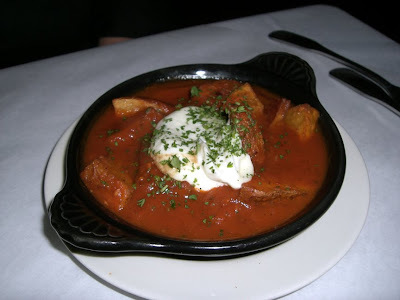 Patatas Bravas ($5): potatoes sautéed in spicy tomato sauce and aioli. Kid Cayenne wasn't happy with these (although the tomato sauce when mixed with the aioli did create a really delicious third sauce that we ended up dipping other things in). Unfortunately, the potatoes were a bit overcooked and lackluster, not to mention completely inundated by sauce, so it brought the whole dish down. 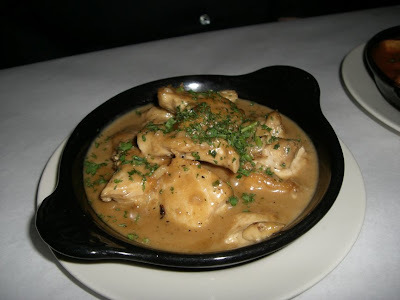 Pollo a Ajillo ($6): chicken sautéed in garlic sauce, finished with sherry vinegar. This dish was a big disappointment to both of us. It was simply chunks of bland chicken breast in what may as well have been a cream of chicken soup gravy. Even the garlickiness (garlic generally wins us over) was unable to convince us that we should have more than a bite. Awful. Manchego and Salami Board ($12? ): This was a special of the night consisting of salami and another cured meat that I do not recall, slivers of manchego cheese, and a small dish of olives. 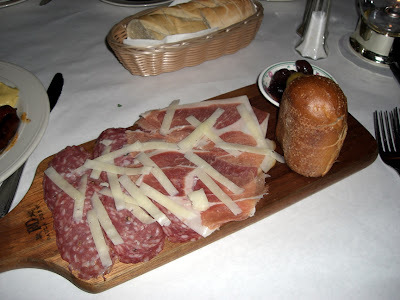 I am a huge salumi fan and was looking forward to overindulging on this platter. Sadly, the quality was nowhere near where it needed to be. The salami was mealy and the texture unrefined. The other meat contained so much gristle that I could not finish the first slice. The manchego was OK but the olives were too soft. I was very, very disappointed. 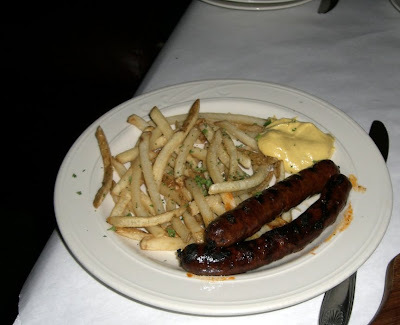 Lamb Chorizo ($8): Open flame grilled lamb chorizo served with fries and creole mustard. This was actually pretty good. The grilled chorizo was flavorful and just the right amount of spicy for my taste. The accompanying mustard was a nice counterpart for it, although lacking the coarse texture that I associate with Creole mustard. The shoestring fries were hot, crisp and delicious (really nice dipped in the sauce from the patatas bravas that I mentioned earlier). I was happy with this dish. For dessert, we split a créme brulée ($5) which was truly the worst créme brulée that either of us had ever eaten. Served cold, with a soggy sugar topping, a lumpy cream texture and no depth of flavor, it was a major letdown. All in all Cafe Granada blew hot and cold, heavy on the cold side. The service was adequate, the wine list was ok, they did a couple of things well and a lot of things not very well. I think this was probably the last time we go. It just isn't really worth it when there are so many other good places to eat in the city. 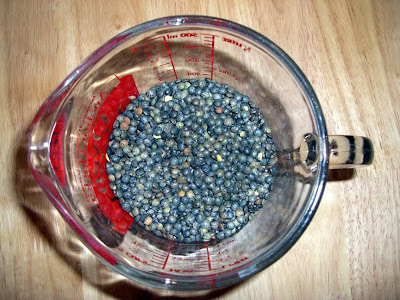 I first read about lentilles du Puy at David Lebovitz's blog, several years ago. 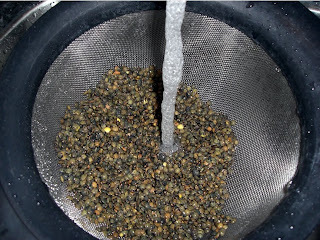 He called them the 'caviar of lentils' and explained that these French green lentils are specifically grown in volcanic soil without fertilization, giving them a flavorful, mineral-rich quality that is lacking in regular lentils. Sounded good to me except that I couldn't find them in any local stores and couldn't see for myself what the fuss was about. Over time, I heard others extoll the virtues of Puy lentils, but without a source, they stayed off my radar. It seemed silly to order lentils on the internet. Sure, they sound nice, but a lentil is a lentil, yes? Except... no. Recently, a British friend asked me if I needed anything from her corner of the world and out of the blue, lentilles du Puy popped into my head. I asked if they were available near her and sure enough, they were common and available in two forms: dry and precooked. She mailed me some of both and now, now I really get it. They are wonderful and completely unlike the mushy, lackluster lentil of my mother's soups. Peppery, substantial, they hold their shape and hold their own. These are lentils with a purpose in life. These are the kind of lentils you can really base a meal around. Last night, I was looking for something warm, nourishing and wintery to cook that didn't have to braise or simmer for a long time. 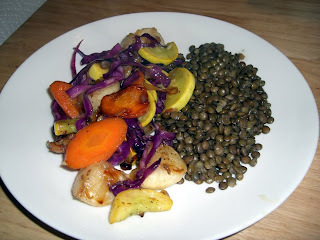 Puy lentils with sautéed vegetables was the perfect thing. 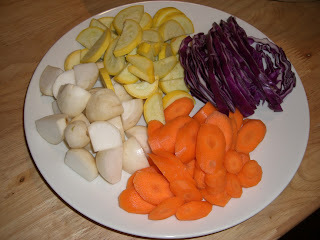 Using the tiny white turnips I got Tuesday at the Hollygrove Market and Farm, a few carrots, a yellow squash and a bit of red cabbage, I improvised a meal. The lentil package instructions directed me to rinse and drain the lentils (I used one cup), put them in a saucepan covered by twice their volume of water, bring to a boil and then simmer for 15-20 minutes until al dente. Then, drain and serve. It also suggested replacing the water with vegetable stock, wine or a half and half solution for extra flavor. I chose to go that route, using a half carton of vegetable stock and some left over sauvignon blanc. I set those to simmer and then began work on the vegetables. Using a large skillet, I first sautéed two chopped shallots and a clove of minced garlic in olive oil until soft and fragrant. 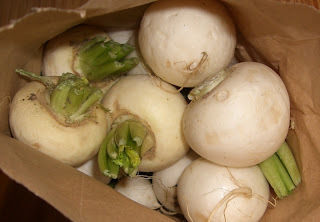 Next, I added the quartered baby turnips, figuring that they would take the most time to cook. 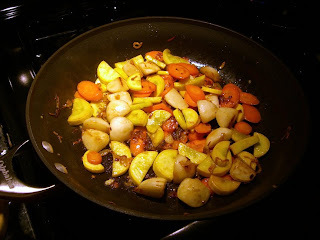 When they were beginning to soften and caramelize, I added the carrots and let them do the same. When both were nearly done, I added yellow squash to the pan and let them all get golden. I also salted the vegetables lightly at this point. 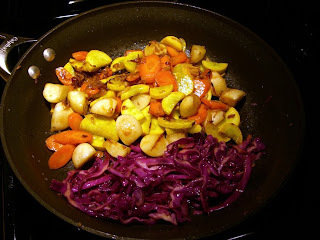 I debated adding the cabbage to the same mix, but decided, at the last minute, to cook it separately so that I could add a bit of red wine vinegar and let it braise quickly before bringing all of the vegetables together in the end. I removed the cooked vegetables from the pan and let just the cabbage, a bit of salt and a sprinkle of red wine vinegar meld together. 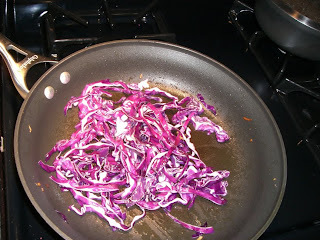 It only took about 30 seconds for the vinegar to absorb and the cabbage to begin to soften at which point I added the rest of the vegetables back to the pan. I don't know if this was a necessary step, really. The vegetables and lentils finished at about the same time. I drained the lentils, returning them to the hot pan, and drizzled them with a bit of nice olive oil. Then I plated the lentils and vegetables together, sprinkled with sea salt and a splash of balsamic vinegar and that was that. I probably would have done just as well to dump the lentils into the pan with the vegetables and let them pick up some of the oil and flavor from the pan. And there it is! A simple, delicious and quick meal for a chilly night. Now... if anyone can tell me where to get Puy lentils in New Orleans, I would be very thankful.